Travelers at the Seoul Railway Station watch a live broadcast of South Korean President Park Geun-hye's address in Seoul, South Korea, Nov. 4, 2016. 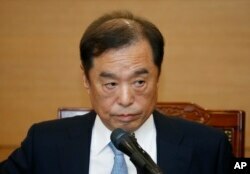 Park took sole blame for a scandal that threatens her government. Embattled South Korean President Park Geun-hye apologized for the second time in a national address Friday, trying to quell the growing calls for her resignation over a corruption scandal crippling her administration. "I feel the deepest regret and apologize to the people of Korea who entrusted me in this position of the presidency. And it breaks my heart to cause this much pain to the people of Korea," Park said. An investigation into an alleged multimillion-dollar influence-peddling scheme involving the president’s longtime friend, Choi Soon-sil, has shattered Park’s image as an incorruptible leader and left her increasingly isolated. It has forced top aides to resign and possibly face criminal indictments, and led Park to sack the country's prime minister, Hwang Kyo-ahn, on Wednesday. A South Korean college student holds a placard depicting South Korea's President Park Geun-hye, right bottom, as a marionette and Choi Soon-sil, who is at the center of a political scandal, as a puppeteer, in Seoul, South Korea, Nov. 3, 2016. Choi is in custody, and the Seoul Central District Court on Thursday issued an arrest warrant that gives authorities up to 20 days before they must formally charge or release her. On Thursday night, Jeong Ho-seong, a former secretary in charge of the president’s private affairs, was arrested for allegedly leaking confidential and possibly classified presidential documents to Choi. Choi is accused of exercising a cultlike influence over Park and control over her staff, though she had no official government role. Choi also is being investigated over suspicions that she exploited her relationship with the president to coerce large corporations to donate more than $68 million to two sports foundations, funneling much of that money to her private businesses. Samsung Electronics reportedly transferred more than $3 million directly to a German sports company established by Choi and her daughter, Chung Yoo-ra. Last week when the scandal first became public, Park issued an apology but did not elaborate on her relationship with Choi, other than to say her friend had helped her with "difficulties in the past." On Friday, Park said she had tried to avoid any conflict of interest in her administration by detaching herself from her family. The leader said she misguidedly put her trust in Choi, who she said likely used their friendship for personal gain, and in close advisers, who may have also engaged in illegal acts without her knowledge or consent. "Looking back I trusted my personal relationship with her and I didn’t know what was going on and I didn’t put high standards on people around me who had personal relationships with me," she said. Park denied the sensational allegations that she was involved in cultlike or shamanistic rituals with the Choi family. Park's relationship with Choi's family dates to the 1970s, during her father's presidency. Park Chung-hee came to power in a 1963 coup and led the country until his death in 1979. Choi’s father, Choi Tae-min, founded and led a religious sect called the Eternal Life Church. He became a mentor to Park while she was acting as first lady, after her mother was killed during a 1974 assassination attempt on her father. A 2007 diplomatic cable from the U.S. embassy in Seoul, released by WikiLeaks, described Choi’s father as having "complete control over the body and soul" of Park during her formative years. Choi Soon-sil is rumored to maintain a similar hold on Park, allegedly influencing her positions, including a hard-line stance on North Korea. Choi has reportedly said she believed North Korea would collapse within two years, based on spirits that spoke to her. The South Korean president, in her address, said she would allow investigators to question her about the scandal, if necessary. That could set a new legal precedent: No sitting South Korean president has been directly questioned by prosecutors in an investigation. Park cautioned lawmakers against letting their outrage over the scandal paralyze the government, especially while the North Korean nuclear threat is growing and the economy is weakening. Choo Mi-ae, leader of the Democratic Party of Korea, criticized the president’s speech, saying more than an apology is needed. "She does not recognize the graveness of the crisis she caused to the system within the Republic of Korea. She is just focusing on maintenance of her power," Choo said. Opposition parties holding a majority in the National Assembly have called for the appointment of an independent counsel to investigate possible wrongdoing by Park’s administration. They say the counsel should not report to the Ministry of Justice, which the president controls. They also demand the president withdraw from nominating a new prime minister and instead let the National Assembly make the selection. Kim Byong-joon, a nominee for South Korea's Prime Minister, speaks during a news conference, Nov. 3, 2016, in Seoul, South Korea. Park has attempted to reshuffle her top leadership to appease her critics, including naming Kim Byong-joon as the new prime minister. Kim is a university professor who was affiliated with a major opposition party in the past. But opposition parties are refusing to hold a hearing in the National Assembly to approve his appointment. In South Korea, the prime minister is the next in line to assume the presidency if the elected leader resigns or dies in office. The Seoul Central District Court on Thursday granted an arrest warrant for Choi that allows authorities to continue to hold her in custody for a maximum 20 days before they have to formally charge or release her. And prosecutors on Thursday night arrested Jeong Ho-seong, a former secretary in charge of the president's private affairs, for allegedly leaking confidential and possibly classified presidential documents to Choi. The scandal, protests, and investigations are taking place as South Korea's Special Representative for Korean Peninsula Peace and Security Affairs, Kim Hong-kyun, and his U.S. counterpart, Joseph Yun, are meeting in Seoul. This is in addition to Japan and South Korea trying to work out a bilateral intelligence sharing deal that’s been years in the making. Miller remains “cautiously optimistic” that South Korea and Japan reach an agreement, but he notes that “anytime you’re doing a deal with Japan involving military or intelligence it’s going to be highly critiqued domestically,” and with everything else going on, these matters become more challenging. Youmi Kim in Seoul contributed to this report, Steve Miller contributed from Washington.